This pet chenille sweater is comfortable, cozy and warm. Comes with a cute little turtle neck collar. Machine washable and soft and smooth. Very reasonably priced at $8.99. Made by doggiduds. 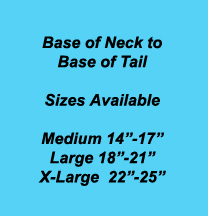 Sizes available are medium, large and x-large, please see size chart above.